A-HOTEL.com - Luxury and cheap accommodation in Karaman Sedmoy, Russia. Prices and hotel, apartment booking in Karaman Sedmoy and surrounding. Offering free WiFi, a sun terrace with a swimming pool and a garden, ALEON HOTEL is set in Makhachkala. Providing a restaurant, the property also has a shared lounge and a bar. Zolotoy pesok is located in Makhachkala and has barbecue facilities and a terrace. The property offers a shared lounge. Hotel SADKO provides rooms in Makhachkala. Boasting a 24-hour front desk, this property also provides guests with a restaurant. Featuring free WiFi, Hotel President is located in Makhachkala. Among the various facilities are a garden and a terrace. улица Гайдара Гаджиева is situated in Makhachkala. The nearest airport is Uytash International Airport, 28 km from the property. Located in Makhachkala, Apartment on Akushinskogo 1b features accommodation with free WiFi. The air-conditioned units feature a kitchen with an oven, a fridge and dining area. Situated in Makhachkala, Tarkho Hotel has a bar. Among the facilities of this property are a restaurant, free shuttle service and a 24-hour front desk, along with free WiFi. 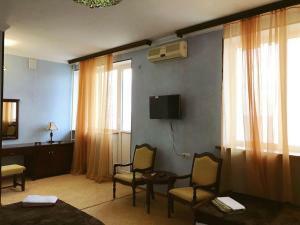 Hotel Markaz is offering accommodation in Makhachkala. The accommodation features free WiFi. Situated in Makhachkala, Hotel ALHAMBRA offers accommodation with free WiFi and flat-screen TV. Each of the air-conditioned units feature a kitchen with a fridge, a stovetop and dining area. Located in Makhachkala, Hotel Lux has a garden and a terrace. The property features a shared lounge, as well as a bar. 1000 i 1 Noch Hotel is situated in Makhachkala city centre. Free WiFi and free underground parking are available at the hotel. Located in Makhachkala in the Dagestan region, Апартаменты у моря features a balcony and sea views. This apartment features a 24-hour front desk and free WiFi. Hotel Kaspiy provides beachfront accommodation in Makhachkala. Boasting a 24-hour front desk, this property also provides guests with a restaurant. Featuring free WiFi throughout the property, Hotel Central offers accommodation in Makhachkala, 500 metres to the train station. Guests can enjoy the on-site bar. Set in Makhachkala, Hotel Lunny Bereg has a garden. Featuring a 24-hour front desk, this property also provides guests with a terrace. Set in Makhachkala, Central City Hotel Makhachkala features air-conditioned rooms with free WiFi. The property provides a 24-hour front desk. Central Hotel Corpus 2 features free WiFi and rooms with air conditioning in Makhachkala. All rooms boast a flat-screen TV with cable channels and a private bathroom. Apartment on Rasula Gamzatova 97b is located in Makhachkala. Guests may enjoy free WiFi. Apartment on Rasula Gamzatova 66 is situated in Makhachkala. All rooms feature a kitchen and a private bathroom. Offering sea views and air conditioning, Apartment near the sea is an accommodation situated in Makhachkala. Guests staying at this apartment have access to a fully equipped kitchen.